We paid for our own Misto Box, but have included referral links in the post. All opinions are our own. A recipe for a great morning in our home includes a great cup of coffee. Hubby and I both love to surprise each other with consumable and delicious coffee for holidays. I was excited to learn about Misto Box and was able to try it this month! I got a great deal for just $5 on the first box! Our review includes some customer service encounters too. My box was returned to their offices as undeliverable (error on zip) and they contacted me RIGHT away. Box was resent to me and then arrived quickly too. Super fast email and phone response! Amazing roasts and delicious morning cups-of-Joe! Bags of beans are SMALL. I was a little shocked. It made about 1.5 pots with our Brewville brewer. Its not a negative, its just a shock when I get the small box with little bags. They want you to buy your favorite each month--like pay for the box, then buy another bag. Good idea, I just can't pick a favorite! In all seriousness, this is a fun box subscription for coffee lovers and for a fun no-closet storage or jewelry space needed in the bedroom. You drink it and its GOOD! We loved all four of our coffee samplers and can't decide which one we might purchase! The website has great accessories if you need some and they are competitively priced! Mugs, grinders, you name it! 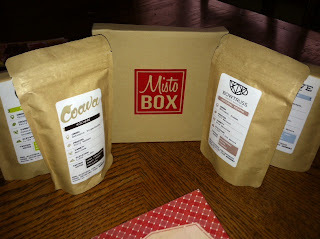 Check it out if you want to try out the Misto Box! This recipe COULD equal happiness for you and your house too!